Producer John Leckie may not be a household name, but thanks to his work behind the boards for a long list of diverse, well-respected acts (including Pink Floyd, Radiohead, all four Beatles, and Public Image Limited), his talents are well known to most rock fans — whether or not they’re aware of it. One of his past projects, the Stone Roses’ self-titled debut, celebrates its 20th birthday this year, and thanks to the good people at Sony Legacy, it’s getting scrubbed and primped for a deluxe reissue — one which Leckie is now out making the promotional rounds to support. Bullz-Eye’s David Medsker, an unabashed Stone Roses fan, naturally jumped at the opportunity to interview Mr. Leckie — and the transcript of their chat is now live at Bullz-Eye. We would make the vinyl master that would then be a CD master, and then it would be copied again for overseas. By the time it’s pressed in America or Australia, it’s a copy, of a copy, of a copy, of a copy. It’s like, well, what are you playing it on? Most people listen to music on iPods or even little speakers on their laptop. Or in the car, with the windows open. Vinyl is an experience. You don’t do anything else. You just sit and listen to it. 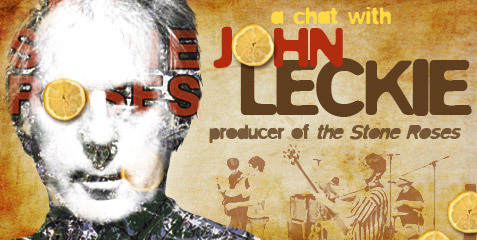 To read more of David Medsker’s wide-ranging interview with John Leckie — including his thoughts on the punk bands of the ’70s, some of his favorite lesser-known projects, and his 20-years-removed perspective on Stone Roses, click on the above image or follow this link!